Technical Specifications can be found in the Literature Library. See link at bottom of the page. AFUE stands for Annual Fuel Utilization Efficiency and is a measurement of the efficiency of your furnace. Comfortable, quiet home heating…that's what you can expect with an Airtemp gas furnace. Less than 35 inches high, with an appliance-grade cabinet, these furnaces reliably and efficiently deliver consistent temperatures throughout the home, year after year. All Airtemp furnaces are engineered down to the last detail for whisper-quiet operation and efficient, worry-free performance. 100% fired and then tested during each critical step of the manufacturing process, Airtemp gas furnaces offer protection you can count on with some of the best consumer warranties in the business. With multi-speed motors designed to provide a wide range of airflow delivery or energy efficient brushless DC (ECM) motors for reduced energy consumption. 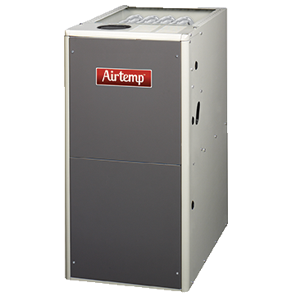 Assures warm air at furnace start-up, eliminates initial rush of cool air during the heating cycle. Multi-port, in-shot gas burner and innovative design features assure cleaner, more efficient combustion. 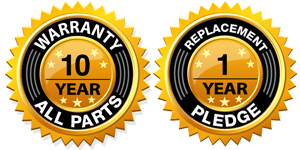 The furnace's key component is backed with a lifetime limited warranty upon product registration. See warranty details for more information. Galvanized steel cabinet for added strength and durability. Silicone-polyurethane finish provides superior scratch and corrosion resistance. Rounded corners provide a pleasing appliance appearance. Lowest operating cost 95% efficiency, two-stage heating, and energy efficient variable speed blower motor for maximum comfort control. Lower operating cost 95% efficiency, two-stage heating, and energy efficient blower motor. 95% AFUE means the furnace functions at 95% efficiency, saving energy and lowering operating cost. Functioning at 92% efficiency, our 92.1% AFUE furnaces offer considerable energy and operating cost savings at an affordable price point. 80% AFUE furnaces are the leading choice when initial cost or low operating hours during the heating season are determining factors. These models are a true value but still fully featured. Airtemp home comfort systems are exclusively marketed by one of our nation's leading HVAC wholesale distributors, R.E. Michel Company. Founded in 1935, R.E. Michel is a family business that has more than 290 sales locations coast to coast that each bring dedicated and knowledgeable field support to the independent professional contractors that install, maintain and service Airtemp products.